Hey guys and gals! It's Friday! YAY!! This week, I wanted to try a pattern that I've had my eye on for a while: the super cute and very intimidating, quatrefoil. For the rest of my nails, I did two coats of Mirrorball, My Way Or The Highway, and Cake Pop. Then I added a single quatrefoil on my thumb, reversing the colours. I freaking love Mirrorball. It's mentalface sparkly in outdoor light. As I suspected, this pattern was pretty time consuming, but it was sooooooo worth it because of the gorgeous factor. I mean, come on. It's incredible! For a special occasion, I'd totally use this pattern again. With the layering of colours, the possibilities are endless! Switching gears for a second, last week was our first themed week of May Flowers, and I think it went pretty well! Would you guys want to keep doing theme weeks? Let me know and I'll put together some new ideas (read: troll Pinterest, haha!). I was super stoked to have a theme! Let's definitely do it again! Those colors are great together. I see what people are talking about now with Mirrorball. 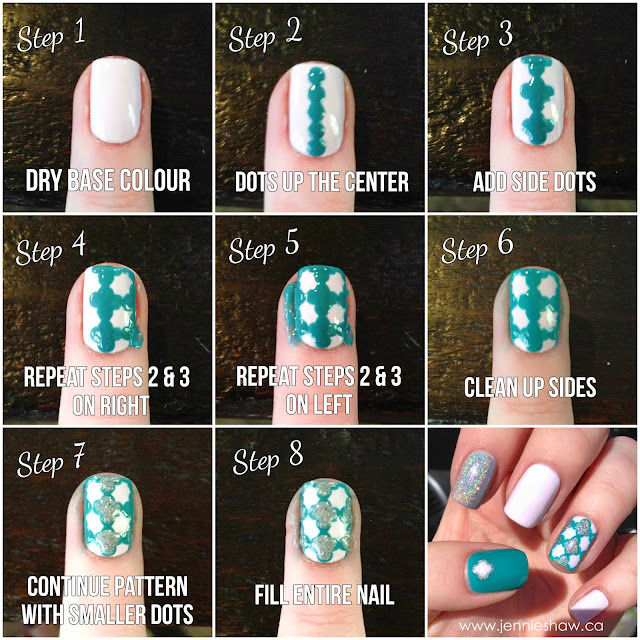 On the nail polish groups on FB everyone is talking about it. I am so glad it's Friday. So going to have to try this out. Loving the pattern.